“Oh yes you do!” we all replied. “You can do this!” And she did. Nervously, Barbara stood in front of a room full of accomplished business people and told her story. Her story? It was about her anxiety around speaking this morning. First, she had asked her husband what story to tell. “Tell them about your trip to Panama and what happened there,” he said. She didn’t think that story was appropriate. She asked her best friend, “You should definitely tell them about Ecuador. They’ll love that one!” No. She didn’t like that one either. She mused about telling us her experience dog sledding. None seemed like the best story. Instead, she told us a story about not having a story. It was masterful. By the time she finished, we were engaged, laughing, and on our feet. And, she taught us about bravery. Gather support from others. Talk about the challenge to people that you trust, just as Barbara sought input from those close to her. Whether she took their suggestions or not, talking generates ideas in your own mind. It helps you see perspectives that you may not otherwise notice. Those discussions give you time to reflect. Depending on your situation, you may not wish to talk to those within your organization. Use your network of peers as a safe place to engage in dialog about new and unsettling challenges. Mikki works with Vistage which provides this type of environment for senior staff and executives. Step into it anyway. Take a deep breath, decide on your first step and take it. There’s nothing like action to quell uncertainty. I have a quote on my wall that says, “Fear fades in the face of action.” Each step forward creates more and more certainty. Maybe the situation will go great and maybe it won’t. In either case, you grow and learn for the next time. Because, as an insightful leader, there will always be a next time. Mikki’s speaker school was an excellent learning environment for speaking, business and, unexpectedly, bravery. Thank you to Barbara for modeling bravery in action. 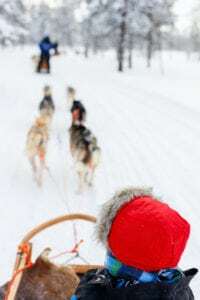 I don’t know about you, but I want to hear about dog sledding! Posted in Neuroscience by Shelley Row on Posted on January 16, 2018 , updated on January 23, 2018 by Shelley Row.